Cute Personalized Watches for Kids Girls in your choice of Watch Colors and check out the different Styles for girls, women, boys and men. Cute Wrist Watches for Girls. Visit our Personalizable Gifts Shop CLICK HERE Call Linda: 239-949-9090. 100% “LOVE IT” GUARANTEE is offered by Zazzle. I bought my 6 year old grandson a watch. It motivated him to learn how to tell time. He is so proud of it and takes really good care of it because I told him that it is expensive and he needs to be really careful with it. That was about 9 months ago and so far he is taking great care of it and has learned to tell basic time. Below are 7 Steps on How to Teach Your Kids to Tell Time by Live Strong. CALL Linda to change my designs, colors or text. Any design in any color and many different girls watch styles. Call Linda: 239-949-9090. Choose another Band COLOR or a different Kids Watches Girls or Ladies with this design in the “STYLE OPTIONS” area to the lower right side of the Pink Watches for Girls and Ladies. Easy Templates to Type in YOUR TEXT or NAME. See the Photo Watch below. Your photo with your childs name typed in or Keep the Cute Teddy Bear Puppy Watch. Her Name is Billie. To Upload Your Picture, Click on the tiny blue word “Change” then Click “Select New Images to Upload” then choose YOUR Photo from Your Computer and Click “Done”. 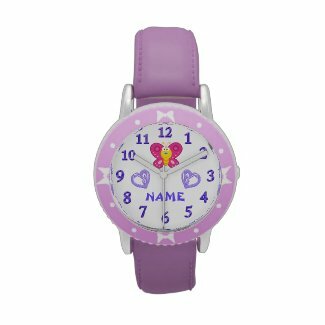 Type in Her NAME into the Text Box Template below the “Personalize it” area to the right of the Personalized Watches for Kids Girls. Click the Customize it blue button if you wish to change FONT Size, Style and Color or Re-Size or Move YOUR Photo around. Detailed INSTRUCTIONS can be found in this products “Read More” of the Product Description. This is my “little sister”, Billie. She is so adorable. This is a photo of when Billie was only 5 months old. So many people come up to Billie and tell my mom how cute she is. That is why I put her on many clocks, watches and other Zazzle gifts but you can put YOUR ADORABLE PET or ANY Photo of Anyone on this clock. Your kids will love it. MIX Up Watches for Kids Girls. Have Fun having different colored watch bands. Super Cute Personalized Rainbow Watch. It will make Great Gifts for Girls, Tween Girls and Teens. Mix and Match Watch Band Colors. Fun to create and more fun to give for Birthday, Christmas or any day. I love the special effects I put on the rainbow and flower and the Glassy Like Watch Numbers. Type YOUR NAME into the Text Box Template beneath “Personalize it” section to the right of the Personalized Watches. Girls will love having their name on their very own watch. What is better than having a Personalized Watches for Girls. It is having really Cute Wrist Watches for Girls in Pinks and Purples. 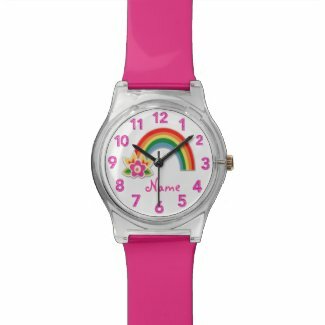 There are great Watches for 6 Year Olds to 10 Year Olds and the Colorful Mix and Match Watches area Great Gift Ideas for Tween Girls. Mix and Match the Colors of the Watch Bands for a really Cute and Fun Look. Type in Her NAME into the Text Box Template located under the “PERSONALIZE IT” area. She will be a trend setter for cool colorful watches for girls. I’ve created many more Personalized Watches for Kids Girls, Boys, Women and Men. These are great first watches for girls and teenagers depending on the style. Size watch descriptions for age recommendations. The featured style is for ages 4 to 12 years old. You will see Personalized Watches for Men, Women, Girls and Boys. Custom T Shirts, Mugs and really cool Personalization Gifts. I love giving Zazzle Custom Gifts because the products are quality, the printing is outstanding and the service is great. 100% Guaranteed, Fewer than 1% of the gifts are ever Returned and they received an A+ Rating from Better Business Bureau. Personalized Watches for Kids Girls by Little Linda Pinda. I can create a watch for you too. Call Linda at 239-949-9090. 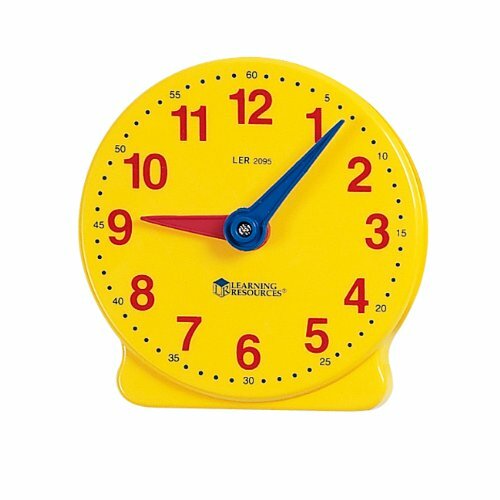 If I were to use a toy clock, as recommended by Live Strong, I would use a simple inexpensive clock like this to teach a child how to tell time. It is simple and cheap because you won’t need to use it for that long. I just used a regular clock to teach my kids. Kids will also love learning to read on their very own kids first watches because it is really special. Water resistant too. I personally wouldn’t spend this much money on a clock to teach my kids but what I do think is cool about this ALARM CLOCK is that it Shows the Time in NUMBERS and the Traditional Clock Face, plus, it is an Alarm Clock and a Night Lite. They will eventually need an alarm clock when they go to school or need to first wake up by themselves. 2. Break it down to halves/quarters for every hour. Using a toy clock to help show them the top of the hour is when the long hand is pointing up on the twelve. Fifteen minutes is when the long hand is on the three. Thirty minutes is when the long hand is on the six. Forty minutes is when the long hand is on the nine. 3. 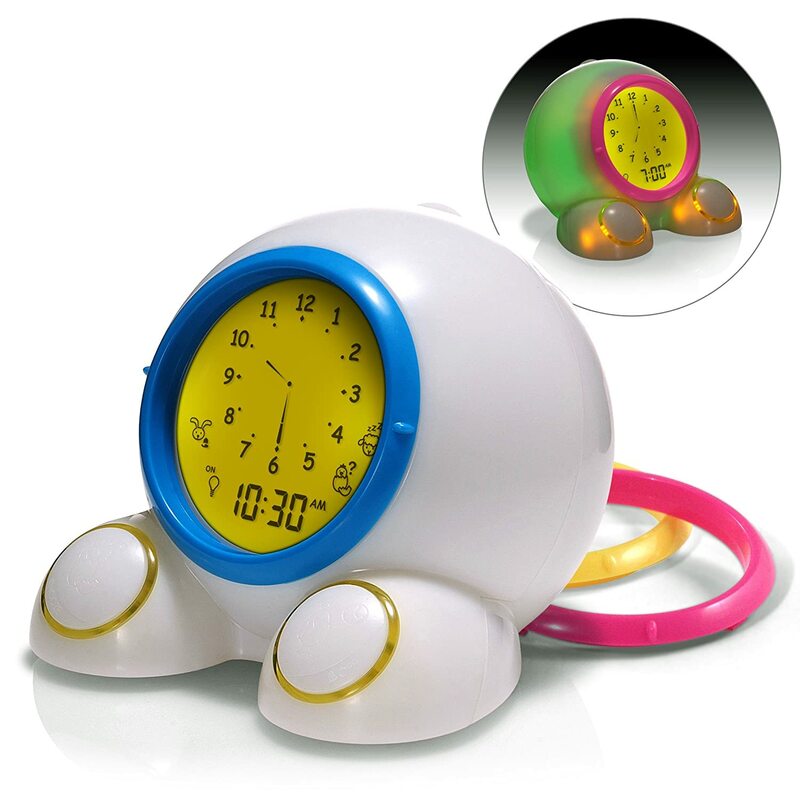 Using the same toy clock, teach them simple times starting with 1:00, 2:00, 3:00 and so on. Now go back and have them tell you each of the top of the hour times. Continue this exercise until they have it down pat. 4. Next, set the clock into fifteen increments such as: 1:15, 1:30, 1:45 and so on. Read the times first for them and ask them to tell you. Be sure to keep reminding them of what the fifteen, thirty and forty five minute increments mean. Do not go to the next step until your child has this one down. 5. Then teach them the five minute increments of the hour. Show them that number one is five minutes, number two is ten minutes and so forth. When the minute hand is on the twelve is the top of the hour. When your child is ready and understands how to tell the basic time, then go into more detail with specific minutes such as: 7:18, etc. Repeat until they understand the minutes thoroughly. 6. Now hand the child the clock. Tell your child to place the hands on the clock and you tell them the time. Do this on a daily basis using things your child likes to do such as: “What time do you eat lunch, 12:00 or 6:00?”, “What time do you go to bed, 4:30 or 8:30?”. Then start asking these questions without giving them any options of the time, such as: What time do we go to the playground every day? NOTE from Little Linda Pinda: I am not an expert on how to teach time, but personally, I would start with a toy clock and showing your child the simple 1:00, 2:00 etc, as my first step. Make it fun and exciting. Get really excited when your child gets it right and don’t spend more then a few minutes for each teaching moment. Incorporate this over and over in your daily life. ALL DESIGNS are available on EVERY Zazzle Watch for the entire family. I appreciate your visiting our Watches for Kids Girls. If you would like me to design a special personalized wrist watch. 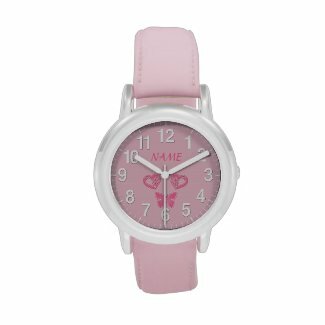 I hope you found some cute girl watches at Personalized Watches for Kids Girls. Call me, Little Linda Pinda at 239-949-9090, for any changes on any of designs.